At first glance, the What Quits First? diagnostic tool looks quite simple in design. A small black plastic box with 2 leads coming out of the top, and branching off into four vehicle hookups. I was impressed with the quality of the leads. They are secured into the body of the case with nylon locks, so it would be virtually impossible to dislodge the leads from the case. At 50 1/2" in length, the leads are long enough to be easily connected to any vehicle. The clips are pretty much straight forward in design, and they are color coded for ease in identifying where they connect to the vehicle. I was also impressed, that the tester, used the external vehicle battery source for power, thus eliminating the annoying battery replacement with some "self powered" units that I have seen. The label on the face of the tester, is simple to read and understand, with instructions that are clear and precise. The package includes the tester (with the leads permanently attached), the instruction booklet, the product registration card (to be mailed), and the box that the contents arrive in. With their obvious attention to detail, they even designed the box to fit in even the shallowest drawers of your toolbox, for safekeeping, and an included bubble wrap pouch, protects the surface of the tester when it is not in use. A package of 10- 7" bright yellow reusable wire ties are also included. Although these seem like simple things, they are much appreciated, and yes, we do notice these small details. The small Red and Black clips attach to the battery terminals, and the large Red clip, attaches to the ignition coil wire, or spark plug wire. The fourth lead, is a sensor that is mounted in a heat shrink tube, which is placed next to a fuel injector, and tied against the injector body with a wire tie. The connection to the vehicle will take mere minutes. What Quits First? is designed to work with most vehicles, but I used a 1995 Ford Mustang with a 3.8L for the test vehicle. This vehicle does not have a problem, but, it is easy enough to create a fault in the various circuits. Connecting the leads to the vehicle was simple and straight forward. Within a couple of minutes, we were ready to test the system. After the lead connection is made, and the leads safely out of the way of any hot,or moving, engine parts, we are ready to test. The Setup Ignition LED is designed for the tool to capture the ignition time constant of the engine. To Setup Ignition, the vehicle is started and then the engine is shut off . The ALT, IGN, INJ LED's will illuminate on the top row (as seen in the picture) when all circuits are working properly. To simulate a problem with the car, I simply removed the Fuel Pump fuse, and within a second, the Mustang stopped running. 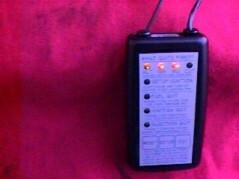 As you can see by the picture, the LED that is on, is the Fuel Quit LED. The LED's on the top row are also off, because the vehicle stopped running. GREAT job, LENEHAN RESEARCH!! Well done! Yeah, that would be something worth investing. I have heard of similar products. Never bought one. I had a buddy of mine who lent one out to a client as the intermittent was far and between. He never saw that client again, and to say the least, that tool found a new home. I think it was a data recorder. Not this lenehan product. The link to Lenehan is in Swedish or Danish. @dabunk, were did you buy yours? And what did it set you back, if I may be so bold as to inquire? I googled it and I could not find were to buy one up here. Every link I find leads back to the swedish/danish site. Would my local snap or mac guy be able to get one? Haven't seen one in any of their trucks before. Lenahan sold it out to Snapon so you can buy from them but twice the price I paid for mine! When Bruce first tested them I read it and had a customer with a real intermittent die problem so I bought one direct from Lenehan for around 200. It was under the customers hood for 2 months before it caught the fault but it caught it. I have used it very few times over the years but it has always found the tough ones for me. Well, just called the snap on truck guy. Discontinued product since 2008. @dabunk, no go for the "what quits first"
I am very happy with snap on customer service. 3/8 ratchet and 10mm and 3/8 impact sockets on the way. Again, @debunk, if you can find the serial/product number that may help. Because the lehanahan/snap on # does not register int their database. I am so surprised I searched Ebay and none on there at all!! Will dig mine out and see if there are any numbers on it. Everywhere I look, sold out. One on ebay was going for 13.50$ and the other one 135$. Obviously the one going for 13.50$ was the first to go. Someone is making a profit, and it's not me. My mother says you are never better served than by yourself. Proof is in the pudding. On a funny note, the lady asked @ snap on to read the serial #'s of my broken tools. I said fine, but they are so worn I need a magnifying glass. I have no idea which ratchet I will get, I just hope it lasts as long as the last one. Period. I am just hoping I get the 15 degree one. I paid two bones for that ratchet, and the 10mm socket costed me a hospital bill. After inventory of my tools, 10 grand. And that is just for my tool chest. Imagine my home kit?? @Dave/dabunk, if you send me a message for the "what quits first" I will send you a herbrand wobble extension. Two foot long and rare as the pope's shyte. It would be a nice addition to your tool box. Advice for any apprentice, the tools you have in your hand are only good enough for the person using them. I have an old sticker on my box. It says touch my tools and die. I remember when Bruce (the "B" in BAT for those who didn't know!) wrote that article. He didn't cite the price, and I can see where as a DIY I would not have bought one regardless. But SO often, that Mystery Quit comes up, and it'd sure be nice to know whether to start with Spark or Gas. Thing won't tell you WHY the system that Quit First DID quit, but at least it'd keep us from looking at the wrong system.